After getting dizzy blog-hopping to see all the new stamps and designs from various vendors, I decided I needed to take a breath and do something simple. I also wanted to submit a card to CAS Colours & Sketches before Monday's deadline! Cuteness seemed appropriate for me, so I used this Lia Griffith for Hero Arts stamp. For color I used a mixture of watercolor pencils and copics, and mounted it on a watercolor background. Did you ever add several new stamps to your stash very quickly and forget what you had? 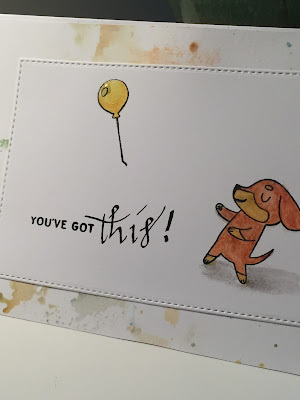 I was sure I had the sentiment "you've totally got this" from Cathy Zielske. Alas, what I had was "you've got a friend." So, with a little masking and some hand lettering, I created the sentiment I wanted. What I found out is: cuteness can be fun therapy! Definitely cute! Thanks for playing along with us at CC&S. This is super cute and very fun! Thanks for sharing with us this week at CC&S! Cute card, thanks for playing along with us at CC&S. Thanks, Bev. No apologies necessary! !